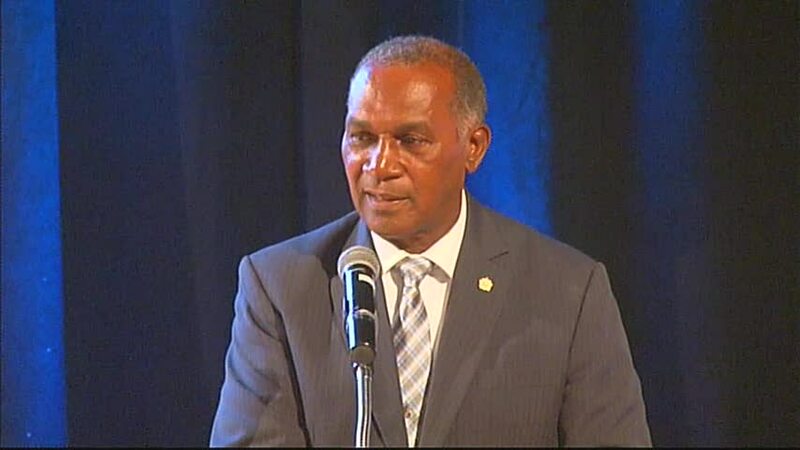 The Minister of Finance who is also responsible for Education, said the tendency to push children to get distinctions mainly in academic areas is a yardstick by which educational performance is judged on the island and that thinking has to change. “We need to begin to make a paradigm shift in how we educate our children and it is in that vein, that I want to state, that this is going to be a major policy change by this government aimed at revitalising skills development and entrepreneurship and it is expanding the Technical Vocational and Education Training (TVET) programme in our schools, as part of our educational reform,” he said. The NIA is also looking at expanding the same programme of physical accommodation at the the Gingerland Secondary School in 2017 for the provision of skills training. Mr. Amory disclosed that a new education policy unfolded two days before, which emphasised a new process of education in which children will be exposed to some practical work at school barring physical or medical impediments. “The reason being, we feel that we want those who are intellectually and academically capable to become the high quality craftsmen and women; to become the designers and dressmakers, so that, here, where there is a demand… there is an opportunity for our students…to become involved in fashion designing…. “Even if we have to import the raw materials, we can create here in Nevis an industry in response to the fact that people will need clothing. Our people like to dress up,” he said. The Premier pointed to the varied disciplines that would be offered in the TVET programme among them Auto Mechanic, Electricity and Electronics, Information and Communication Technology (ICT), Hospitality and Culinary arts, Air conditioning and Refrigeration, Agriculture Science, Food Preparation, Welding, Landscaping, Plumbing, Bee Keeping, Cosmetology, Accounting and Building Construction. However, Mr. Amory stated that even as the administration is putting these programmes in place, the attitudinal change to education is important so that the areas of study are readily accepted and seen as being beneficial so that they poised to take advantage of opportunities for employment in those areas. He said as a result, when needed, the expertise and skills would be readily available on Nevis and not have to be imported. Meantime, the Premier reminded of the open market existing in the Caribbean and urged all to take advantage of the Adult and Continuing Education programme to develop vocational skills and acquire the certification to prevent being disadvantaged in the world of work. He also spoke to the Parental Engagement Programme which will be offered. It will involve workshops to provide parents with effective and practical strategies and resources to help their children succeed in life. “[That is] very important because we believe that we have seen an abdication of our parents responsibility and while the school is prepared and while we are saying to the schools that they need to take up that mantle, there is no substitution for parental guidance and parental care at home for their children,” he said.